Yoshihiro Nishimura has another film planned for 2016 after Meatball Machine: The Embalmer. It's an Australian production, to be filmed in English in Japan. Little details so far, Nishimura just said it's going to be a "suspense film". Has that ever worked in any movie's favor? All I can think of are films from Miike and Tsukamoto that I cringed my way through with gritted teeth and will never revisit. Has that ever worked in any movie's favor? Swallowtail Butterfly (1996)! Not entirely in English though. Number 10 Blues: Goodbye Saigon (1975/2013)! Not filmed in Japan, though, and not entirely in English. Virus (1980)! Not entirely in English and most of the cast not Japanese, though. 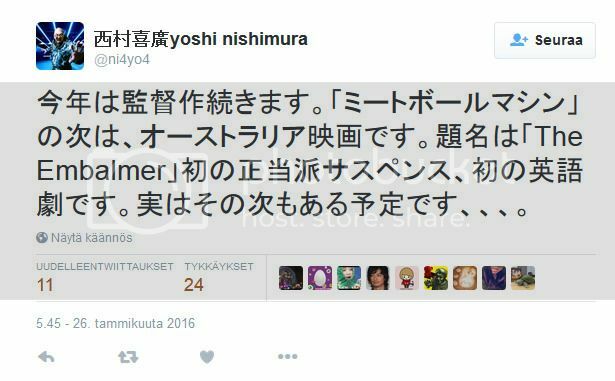 According to this new interview from the Fantasia Film Festival, Nishimura still plans to make THE EMBALMER. He also has a second film in the works but doesn't give any details. A friend of mine read Nishimura's interview in Eiga Hiho where he also said that he lost money by participating in Shin Godzilla. Nishimura said Anno barely made any money either, only Toho profited from the enormous success.